Large portion and tasted great. Staff is friendly and actually asked for feedback on portion size and price. The people that own the truck are very nice and they understand exactly what you want. I'm Korean and I miss that grandma type of Korean cooking and this hits the spot every time. I like my rice bowl spicy and it is so worth that $10. I always get the egg on top. 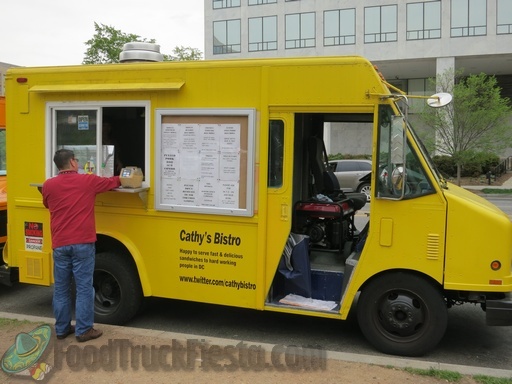 I tried Cathy's Bistro today for the first time, at Solutions Drive in Tysons. The beef bulgogi was nice and spicy, and the portion was very generous. The service was very friendly and efficient, and I will definitely buy from Cathy's again! This is my favorite truck. The Bibimbap is huge, flavorful, just as spicy as you want it, and loaded with fresh veggies. This is one of the best bibimbap's I have ever had and I have gone to Korea!!! Cathy's bistro gives a great portion and their customer service is incredible. I gave this truck 3 stars because the beef was tender and flavorful and because of the large quantity of food. However, the reasons I could not give it 4 or 5 stars are: the bean sprouts had an odd, musty taste...I have never had this type of sprout before, so maybe that is just how they taste; and the amount of liquid from the beef and vegetables which soaked into the rice. Cathy's is a "go to", and I get the spicy pork every time they are at L'Enfant. Nice size portion, great and consistent flavor, and very friendly with respect to service. There is a reason this truck usually has a long line. The only "complaint" would be their sides are limited...but their kimshie is awesome so a double order of that more then makes up for it. Delicious! Love all the "sides" and the easy over egg with the delicious spicy pork! Chicken is also good. Cathy's keeps me lovin' it!! Just the right amount of spice. Loaded with cucumber slices, carrots, kimchi, sprouts & collard greens. This egg is over medium, not scrambled. $10 for the dish & enough to feed 2 ppl. On July 10, 2012, Yellow Tin became Cathy’s Bistro, serving up something different.